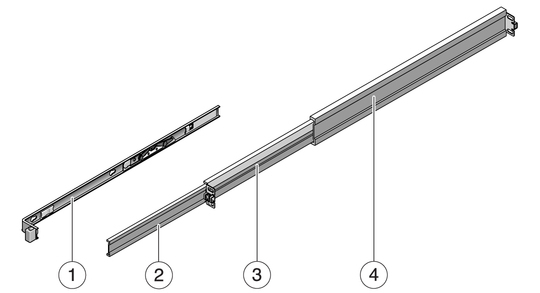 The rackmounting kit has two slide rail assemblies. 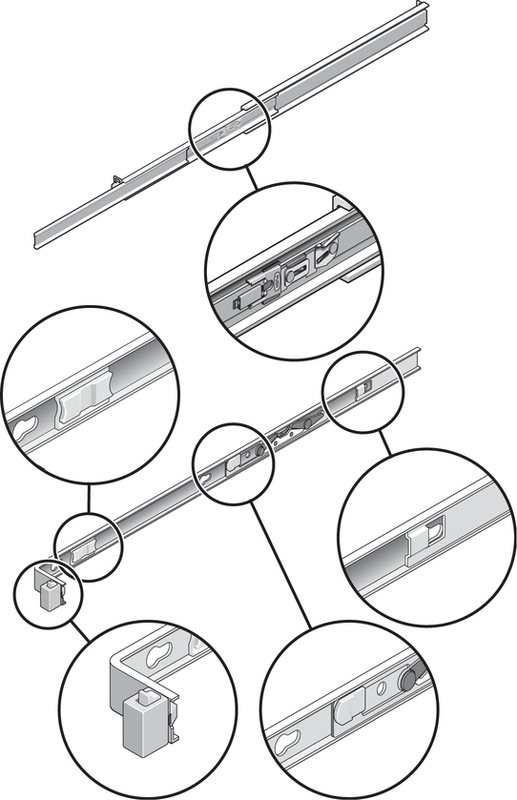 A slide rail assembly can be installed on either the right or left side of the rack. Note - The slide rail assemblies are different for the T5120 and T5220 servers. The removable mounting bracket of the SPARC Enterprise T5120 rails slides 13 in. (33 cm) out of the slide rail, then locks in place. The removable mounting bracket of the SPARC Enterprise T5220 rails slide 14 in. (35.5 cm) before locking. Each slide rail assembly consists of a three-section slide rail and a removable mounting bracket. The front, middle, and rear sections form the slide rail. The middle and rear sections have holes for mounting screws, and adjust to fit rack depths from 24 in. (61 cm) to 36.5 in. (93 cm). The front section can be extended to allow movement of the server out of the rack. The removable mounting bracket slides 14 in. (35.5 cm) out of the slide rail, then locks in place. If you unlock the mounting bracket at this point, it slides an additional 12 in. (30 cm) before separating from the slide rail. You can then mount the mounting bracket to the right or left side of the server chassis. Note that there are five locks in a slide rail assembly. Four are on the mounting bracket. One lock is on the front section of the slide rail. The locks are described in Installing the SPARC Enterprise T5120 and T5220 Servers.